Traditionally, Bundelkhand is not known as a major vegetable production region. Cultivation of vegetables for sale in market and generation of income has been restricted to a few locations, such as Newari block of Tikamgarh district, and/or households of certain socioeconomic groups (eg Lodhs) having irrigation facilities, many heads of cattle (and thus FYM), and tradition of cultivating vegetables. Apart from suitable agro-climatic conditions, assured supply of water is required. Vegetable cultivation requires more labour and attention than cultivation of staple crops. As most vegetables are highly perishable, and have limited shelf life, quick access to market, or to cold storage facilities, is the key factor determining whether a particular location is suitable for vegetable cultivation or not. Keeping above in mind the above, there is scope for promoting vegetable cultivation as an alternative or even primary source of income for small farmers in particular locations of Bundelkhand. The Tikamgarh block of Tikamgarh district, MP, is one such area, as (i) agro-climatic conditions are suited for the cultivation of a number of vegetables including brinjal, chilli, tomato, potatoes, garden peas, etc (ii) a large part of the cultivated area is irrigated, mainly through dug wells (iii) most villages in the block are well connected by tar roads to the large markets in Tikamgarh and Sagar towns. 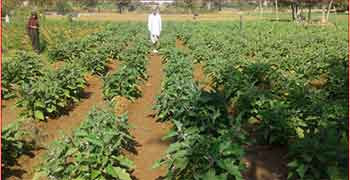 Under its Bundelkhand Rural Poverty Alleviation Model (BRPAM) project (March 2011 to August 2014, and extended), ABSSS decided to leverage these advantages to promote vegetable cultivation, particularly among SC/ST households, who form the target group of the project, and have traditionally not done vegetable cultivation on a commercial scale. The 20 villages/hamlets selected for intensive intervention under the Project are located in Tikamgarh block of Tikamgarh district, MP, at a distance of 20 to 40 km from Tikamgarh town, and 50 to 70 km from Sagar town. The topography of the Project area is generally marked by a gentle slope from south towards north. Around 75% of the soil found in the Project villages is of the coarse-grained grey variety locally known as Parua, or coarse-grained reddish brown variety known as Rakar. Soil tests show that soil has normal pH and EC, low to medium organic-carbon content, low phosphorous content and low to medium potash content. The climate of the area is characterized by a hot summer and general dryness except during the southwest monsoon season. The normal maximum temperature, recorded in May, is 41.8° C and minimum temperature, recorded in January, is 7.0°C. The normal annual rainfall received in the district is 1057.1 mm. Maximum rainfall (about 90%) is received during southwest monsoon period from June to September. Relative humidity exceeds 87% in August. The driest part of the year is the summer season, when relative humidity is less than 35%. May is the driest month of the year. Data on rainfall for last 12 recent years shows that in six years rainfall was significantly below normal, and in one year (2007), it was 50% below normal. In two years including 2013- 14, rainfall was much above normal. In any year, highest rainfall generally falls in June-July. Around 2500 families live in the 20 villages/hamlets covered intensively by the Project. Of these, 30% belong to SC groups, 14% belong to ST groups and 56% belong to OBC groups. Barring 6% of the families, all families own some agricultural land. However, 44% of the families own less than 2.5 acres (1 ha) and another 38% own between 2.5 to 5 acres (1 to 2 ha). Thus 80% of the population comprises marginal and small farmers. Of the total 6823 acres of cultivable land in the 20 villages/hamlets, around 60% (4037 acres) is irrigated, and of this, around 67% is irrigated by privately-owned dug wells. Around 15% of the irrigated land is irrigated by tubewells, and 13% of the irrigated land is irrigated by lifting water from nallas or rivers. Of the total cultivable land, 80% is sown in the Kharif season and 70% is sown in the Rabi season. Wheat, soyabean, and urad are the major crops accounting for 60% of the gross cropped area. Mustard, til and paddy account for around 5% of gross cultivated area. Around one-fourth of households cultivate vegetables in kitchen gardens and/or parts of their land. Main kitchen garden vegetables are tomato, brinjal, bottle gourd, pumpkin and bhindi (lady’s finger). In addition, a few families grow coriander and cucumber. Some vegetables are grown on commercial scale, with chilli, tomato, and brinjal accounting for two-thirds of the area under commercial vegetable-cultivation. However, the commercial scale is modest: except for onion, which is grown by a couple of farmers in areas over 1 acre, average area under commercial vegetable-cultivation per cultivating household ranges from 0.3 to 0.7 acres. Moreover, till project intervention, the commercial cultivation of vegetables was done only by farmers belonging to OBC and General Groups.